Although California regulators have deferred to the U.S. Food & Drug Administration’s hard-line stance on CBD as a food or supplement additive (underscoring the prohibition on CBD-laced foods even after the passage of the 2018 Farm Bill, which legalized industrial hemp), there are indications we could soon see a shifting tide. In February, the FDA commissioner told Congressional leaders the agency may consider eventually allowing food infusions of diluted CBD with low-THC (tetrahydrocannabidinol – the cannabis compound with psychoactive effects). There is no guarantee on when that might be, though. A more recent amendment of AB-228 in California opened the door slightly to sales of CBD food products, so long as the CBD was hemp-derived (as opposed to cannabis-derived) and had been fully licensed and regulated throughout the California cannabis supply chain. Other states have set forth their own CBD food and drink regulations. Although enforcement of federal regulations pertaining to CBD products hasn’t appeared to be a top priority for many agencies, that’s not to say that couldn’t change at the drop of a dime until there is formal protection under the law. That’s why any company producing or selling/marketing CBD-laced products should discuss the existing (and seemingly ever-evolving) regulations with a Los Angeles CBD business attorney. 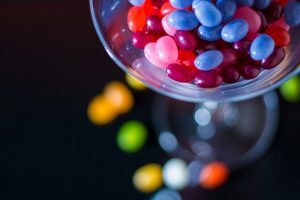 Jellybeans were widely known to be the favorite of late President Ronald Reagan, though given his strict “Just Say No” stance on all drug use, we can’t say he’d have been all that enthusiastic about the CBD-laced version in the candy dish. On the other hand, CBD lacks the same sort of psychoactive “high” that one derives from other products containing higher levels of CBD. Plus, it has a number of purported health benefits, helping with everything from anxiety to epilepsy (the latter formally approved by the FDA). Many selling CBD-infused products for recreational users tout its relaxing effects, as well as its purported effectiveness with post-workout healing and general mental wellness. The new line of CBD jelly beans come in an array of three dozen flavors, the sweetness masking the 10 mg of CBD contained in each one. They also are not marketed to children. The company requires users be at least 18 to purchase them. Most children won’t have the means to purchase them anyway, as an 800-piece bag sells for $600. Will CBD Jelly Beans Cause a Drug Test Fail? CBE is a chemical compound that can be derived either from hemp or cannabis that can be extracted into an oil. Per the U.S. Centers for Disease Control and Prevention, it is not a compound that will make a person “high” because it impacts different nervous system parts than THC. Genuine CBD oil should not result in a failed drug test, but there is a possibility if there is cross-contamination with THC. It’s important for individuals who need to pass a drug test for work to conduct research on the CBD product of purchase to ensure the product is pure. The CBD jellybeans are produced not to include THC, according to the manufacturer.